On the 4th of July, 2004, ADAGIO was clean, repaired, polished, reprovisioned and the crew was exercised and rested. We hoped to depart Bora Bora on Wednesday, July 7, after checking out of French Polynesia, getting our bond refunded at the bank, and buying duty free diesel fuel. We expected to have favorable southeasterly winds for the first five days, followed by light winds in the vicinity of the equator, and finally northeasterly trade winds for the last third of our passage to Hilo, Hawaii. While in the light winds, we would try to make as much distance possible in the eastwardly direction to position ADAGIO at a comfortable wind angle (aft of the beam) when we reached the northeasterly trades. We expected to be in Hilo around July 22, give or take a few days. As we waited for our departure date to arrive, we went out in our fast “expedition” dingy ALLEGRO most days, snorkeling in numerous places around the small islands (called “motus”) near Bora Bora, enjoying the multitudes of tropical fish, and the spotted rays which glide and “fly” above the white sand bottom of the channels. Baguettes, pain au chocolat, and tarts au fraises (strawberry tarts) have been frequently on our menu. One of our favorite haunts was an internet Patisserie where one could browse the web while nibbling on a French pastry. Before our departure we phoned to order a dozen tarts au fraise, and misunderstood that the tarts would be ready by noon, but it turned out that it was noon when the shipment of California strawberries arrived, after which time the tarts could be assembled by the pastry chef. On the way back to the boat I bought five fresh vanilla bean pods from a woman’s roadside produce stall, and later wished I had bought more. They were soft and fragrant. On the morning of July 7, we were still experiencing wind and rain from the cold front that had passed through overnight. 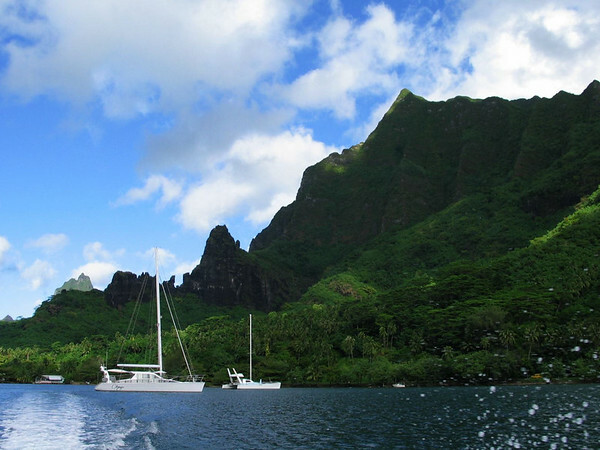 The sky cleared, but when we departed Bora Bora at 3 PM the true wind speed was 32 knots from the southeast. For ADAGIO, these were perfect conditions for a speedy passage. Sailing on the starboard gybe four hours later, it was a bit rough and rolly but we were making good time. Our boat speed wandered from 9.5 to 11.5 knots, as the wind speed wandered from 25 to 34 knots. We hoisted the mainsail to the second reef and discovered that we had attached the two-part main halyard with twists in it, so we lowered the main, untwisted the halyard, reattached it, then hoisted the mainsail to the first reef. We unfurled the jib, but when the winds reached 30 knots we furled the jib again. The winds stayed in the 20’s for all the next day, and ADAGIO zoomed along at 10 and 11 knots boat speed. Our first 24 hour run was 203 nautical miles. The weather forecast showed a convergence zone to the north of us which could bring poor visibility with rain and possibly a few squally thunderstorms. By the morning of the third day, the seas were down a bit and the wind had decreased to 13 to 24 knots. A light rain shower at dawn brought a full double rainbow off our port quarter. The clouds were clearing. We were three and a half days sail south of the Equator, and two days from where we expected to encounter the South Equatorial Current. The wind stayed in the 20’s and the seas got up to 3 meters again, giving us a good second day’s run of 223 nautical miles, under jib and one reef in the mainsail. After dinner, ADAGIO surfed at 14+ knots of boat speed in 25 knots of true wind speed. The wind speed seemed to increase for an hour or so just at sundown, and we had 28 knots of wind at 9 PM. A sky glow off to port was thought to be the moon setting. lightning. By morning the wind was light and variable, and the seas were down from 3 meters to 1 meter. By 0730 hours, the wind had filled in from the east, and once again the reefed sails were filled and drawing. A second convergence zone was ahead. We would have to cross it, so we would not be raising full main and reacher until we had left it in our wake. We all slept better in the calmer conditions. Our position was 520 nautical miles south of the Equator and 420 nautical miles due west of Nuku Hiva in the Marquesas Islands. There were a few rainshowers ahead, but overhead the sky was blue for the first time since our departure. The weather report described very rough seas to the south of us, sent north by a deepening low to the south. We were glad to have made such good time away from that area. By the afternoon of July 10, a light wind had filled in from the northwest. The barometer had fallen 4 points in the past 2 hours, which was a puzzle. A few high cirrus clouds and some altocumulus clouds were about. Fair weather cumulus clouds rimmed the horizon ahead and some convection clouds lay astern at a great distance. The Line Islands (Kiribati) lay 250 nautical miles to port. We furled the mainsail and jib, and motored with the two engines at 2500 rpms. Our books, iPods, and remaining strawberry tarts and Pain au chocolat from Bora Bora, kept the crew happy. We wished we had bought more mangoes before departure, and the melons and bananas were ripening quickly. The green tomatoes were turning red at just the right rate for our consumption. A few tropic birds flew nearby after departing Bora Bora, but we saw no birds while at sea. We missed seeing the albatrosses. ADAGIO’s decks and windows had been rinsed by the night’s rain. This was cruising! During his routine inspection of the rigging, Callum discovered that the threads of the Reef-rite boom tension rod had sheared off at the aft bulkhead, and the nut was gone. There was no way to jury rig a repair at sea. Callum wedged a softwood block forward at the mast to prevent the rod from chewing up the mast. Steve used our Iridium satellite phone to telephone Kevin, the maker of our Reef-Rite in-boom furling system. He told us that the broken rod was not essential to the system, and said we could hoist the full main and go sailing. Reef-Rite would send us instructions for repairing the reefing system in Hawaii. Meanwhile we were to sail with the mainsail fully hoisted or fully furled, but not reefed. So we were sailing under full main and jib, in 9-10 knots of wind, making 6.6 knots of boat speed over the ground. Our course took us to the south east of the Big Island of Hawaii, so that when we encountered the NE trades, the wind and sea would be on our starboard quarter. The winds stayed light, and we cacluated there to be twelve more days to Hawaii at the current 6 knots of boat speed, motorsailing with one engine under full main and jib. After fresh banana sorbet for lunch in the warmer weather, Vanessa improved our view of the world by catching a lovely tuna fish for our dinner. We prepared Polynesian poisson cru and consumed our last fresh mango and strawberry tart. The radar had been absolutely empty for two days, showing not even the ususal reflections off of rough seas. The wind was filling in from the northeast, occasionally swinging around to the east. We received an update from our weather router Rick Shema. He advised a new aim point of 10N latitude 145W longitude. A frigate bird was flying overhead. A few more clouds appeared in the sky. For lunch we had mango sorbet after our turkey sandwiches on baguette. We kept the boat speed above 7 knots by motor sailing occasionally with one engine when the true wind speed dropped below ten knots. The jib foil separated again, about 1/3 of the way up. Two of the black sections opened and closed as the sail worked in a seaway. It would not be a problem if we did not have to change headsails. Callum wondered if the gap could pinch and perhaps tear the jib fabric when the jib was furled. Equatorial Dry Zone”. Our progress north was being boosted by the North Equatorial Counter Current. On Tuesday, February 13 we expected to cross the Equator — a first for ADAGIO and her crew. Conditions were superb. We were experiencing winds greater than forecast. Instead of 3 to 10 knots, we had 10 to 14 knots, and the seas were lower than forecast. What more could we have asked? The wind was even veering, so we expected to be able to set our huge reaching sail. SPCZ, and we would be influenced by the North Equatorial Current. starscreen before going on deck. We had not seen a ship since departing Bora Bora, but we monitored the radar vigilantly. Our little sailing island was visited by a gannet and by a very tattered looking Frigate bird, who looked as puzzled to see us out in the middle of the ocean as we were to see it. We occasionally mistook flying fish for small birds because they were airborne for such a long distance. Monday’s sorbet was mango. On Tuesday we tried pineapple. These treats were made from the excellent fruit puree’s from Bora Bora, and wished we had bought more. We had never imagined how delicious pureed banana drink could be, and it also made delicious sorbet. We also wished we had bought more New Zealand apples in Bora Bora — the excellent grown-for-export Pacific Rose apples, each one a beauty. Out came our Hawaiian Cruising Guides and maps and charts. We spent most of our time reading, sleeping, dining and being entertained by the bantering and sparring between our Kiwi and Aussie crew members. It was like listening to a foreign language, as many of the jokes flew right over our heads. But if they were happy, we were happy. It was such a pleasure to have two such keen sailors, hard working and good humored, aboard. We sailed across the the Equator under full mainsail and reacher at about 4PM on Tuesday, July 13, but the King Nepture ceremony was upstaged by the generator overheating and shutting down about 15 minutes before we crossed the Zero Line. The King found himself in the machinery space with pollywog Steve fishing for impeller bits in the cooling water. Bits were located and removed, but by the time all was once again sorted, the Equator had passed under our keels, and we were in the Northern Hemisphere. Instead of feeding the traditional ceremonial green goo to Dorothy and Steve to celebrate our first crossing of the Equator aboard ADAGIO, Vanessa landed another tuna for our dinner. I remembered to take the southern hemisphere compass unit out of our hand bearing binoculars and replace it with the northern hemisphere unit. During the evening the Equatorial South Counter Current was really ripping, east setting at 2 knots. A ship passed us 4 nautical miles away on the starboard side heading south. We were not alone on this big ocean after all. The morning’s sunrise was the usual spectacular, 360 degree panorama, beginning with the pink sky all around, and concluding with the blazing appearance of the sun coming up from the horizon. Above it all danced the crescent moon and the planet Venus. We were motorsailing under full main, jib and one engine, making 7.5 knots boat speed in 10.5 kts true wind speed. We hoped to be able to set the reacher, if the wind stayed at 10 knots. The days had been very hot, but with extensive high cirro-stratus clouds covering most of the sky, we hoped to have a bit of a respite. Our giant reacher sail served as a huge awning, shading the boat from the sun in the afternoon. The cockpit was a pleasant, breezy and cool place for us to sit out of the sun, reading our books and watching the ocean go by. When the seas were calm, the reflections of the sunset’s blazing sky in the undulating seas found us floating in flames licking at the hull. A small flock of boobie birds flew around and landed several boat lengths to starboard in the firey slick. In the late afternoon Vanessa spotted a dolphin, leaping, swimming on a reciprocal course to ours. He was heading south. At 8 PM the Big Dipper and North Start were low on the horizon off our port bow and the Southern Cross had disappeared beneath the southern horizon. The stars in the Milky Way were quite remarkable. No sailor enjoys sailing to windward. Keeping the winds and seas coming from behind us makes for a much more comfortable ride for the crew and less stress on the boat. We stayed south of 30 deg South latitude after departing New Zealand, to stay in the westerly winds. Now we were staying east of the longitude of Hawaii, so that when we reached the Northeast trade winds, they would be on our starboard stern, and not on our bows. Another reason to stay east of the rhumb line to Hawaii was that the Intertropical Convergence Zone between our present position and Hawaii was more active, with more powerful thunderstorms, west of 148 W longitude. We expected the thunderstorms would be less vigorous if we were to cross the ITCZ at 145 W longitude. At dawn on July 15, Callum was operating the port side electric winch normally as he stood at the top of the steps going down into the cockpit, unfurling the reacher. Dorothy had just come on watch and was standing in the doorway to the cockpit watching, unbelieving what she was seeing, as the reacher sheet fouled as it exited the self tailer, wound around the top of the winch, and destroyed the entire self tailing aparatus, breaking it into bits. Callum quickly stopped the winch, leaped into the cockpit, and began disassembling the mess. We did not have a replacement part aboard, never expecting such a freak accident to occur. This left us with one electric winch rather than the usual two to operate our gigantic sails. The wind speed remained at 12 to 13 knots out of the southeast, and our boat speed stayed between 8 and 10 knots. But the true wind angle continued to increase, and a strong east south east setting current set in, so we were soon sailing dead downwind. Up went the spinnaker with the full mainsail. By afternoon the sails were flogging so we lowered the spinnaker and furled the mainsail, turned on the engines and motored into light winds. By the next morning we saw thunderclouds to port and starboard, the wind speed dropped to three knots. In the morning Vanessa set the fishing lines and within 10 minutes she had caught a 17 lb tuna. Steve helped land it and Dorothy filleted it. What delicious sashimi was immediately consumed, and then poisson cru for lunch. Tonight we will poach some of the fish in soy, rice wine and sesame oil and serve over a bed of lemon rice with snow peas and chopped scallions. “It’ all swings and roundabouts”, said Vanessa. On the afternoon of Friday, July 16, our position was 500 nautical miles north of the Equator and we were crossing through the Intertropical Convergence Zone which was full of thunderstorms. From our cozy saloon we could see rain clouds all around us. Some were shaped like the nasty roll cloud of the Australian “southerly busters”. But so far we had received only light rain, and variable winds. The seas were a bit rough. We expected to be out of the ITCZ and into the northeasterly trade winds sometime during the next day. All sails had been furled, in anticipation of strong winds in thunderstorm cells. Both engines were pushing us towards our destination. At the speed we were traveling, our range under power was about 690 nautical miles. We were covering about 175 nautical miles per day, against an unfavorable current. We would ordinarily been preparing to set our sails again, but due to a Low Pressure system located near 9 degrees N latitude 136 degrees W longitude to the east of us, there was a chance of strong northerly winds rather than the northeasterlies we had expected. In the afternoon, we increased engine revolutions to to 2700 rpm to raise the boat speed to 8 knots in order to stay west of the storm system which was moving WNW at 10 knots. The next morning the wind filled in from the southeast, and was soon blowing 20 knots. We turned off the engines and hoisted the full main and jib. The sky was clearing, and we would soon be exiting the ITCZ. Cumulus clouds were all around with heavier clouds off to port. Blue sky lay ahead. The radar screen was clear. We estimated four and one half days to Oahu at our present rate of speed rate. The barometer was lower than it had been for a long time, at 1007. Steve had set our course to make landfall in Honolulu rather than Hilo so that we would have an easier time obtaining the boat parts we needed to effect repairs to the tension rod in the boom and our electric winch. We began to see more birds, including the masked booby, the beautiful Hawaiian petrel, and an elegant sooty tern. One small petrel was sitting in the water, struggling to pick up a big fish it had caught. knots of true wind speed, over a 1.5 meter swell, with a comfortable motion. The apparent wind angle was 90 degrees. ADAGIO carried her full mainsail and jib. Puffy white cumulus clouds all around, deep blue sea and powder blue sky. decided he enjoyed the sailing so much, that he continued on around the globe for another half circumnavigation, rather than finish the race? He must have been experiencing sailing conditions like this. We were going to be sorry when such good sailing conditions were over. In spite of her disabilities, ADAGIO was not exactly limping along. The true wind speed had increased to 25 knots, and our boat speed was 10 to 13 knots. We had covered 196 nautical miles in the past 24 hours. A few small rainshowers appeared on the radar. It had been a bumpy night. We altered course 20 degrees to leeward to ease the pounding until the wind speed fell back to 20 knots, at which time we returned to our course to steer 305 degrees to Hawaii. The seas seemed steeper and the waves closer together. This might be due to the contrary current. The front windws had seeped salt water a little bit over night. We were not trolling a fishing line because yesterday’s fish provided enough food for several days. Steve sent an email to the Hawaii Yacht Club to request a berth for a week. Friends had told us that with our San Francisco Yacht Club reciprocal privileges, it will be our best bet. We were also scratching our heads for the names of people we might know who live in Honolulu, to help us source some of the boat parts that we needed. I was disappointed that we would not be visiting Hilo and the Big Island to see the volcanoes, but Alaska called. We hoped to depart Honolulu for Sitka before the end of July. Friends in the Bay of Islands, New Zealand reported having ice on the decks of their boats, and frost in the fields. Steve turned on our generator so that we could run the air conditioner. In spite of the tropical heat, the cockpit in the shade was pleasant for reading and watching the sea go by. It was relaxingly uneventful out on the ocean, just sailing along, savoring the serenity before we entered the hubub of Honolulu. On July 19 we awoke to a beautiful morning, and as Vanessa said, conditions were “fab”. It had been peaceful sailing through the night. The night before had been windy and a bit rough, but over the past 24 hours we had been cruising along at 9 knots, reeling off the 200 nautical mile days again. The northeast tradewinds were steady and predictable. We just trimmed the full mainsail and jib for an apparent wind angle of 95 degrees and sailed on mile after mile. We had been at sea for almost 12 days, and I was afraid our crew were becoming bored. They had each read over a dozen books, and listened to our audio books during their watches. Only three more days to Honolulu at the rate we were going. rinse. Several flying fish left their slimy scales stuck to the decks and windows during the night. exception of a “Shearline trough” located north of Hawaii and moving slowly towards the southeast. It would be nice to have fair weather when making landfall on Thursday, July 22. Our friends in Hawaii recommended a new marina located to the west of Pearl Harbour. The marina could fit us in, and it shares a harbor with the largest marine shop in Hawaii, where we hoped to find the rod required to repair our mainsail furling system. We were keeping an eye on the progress of a tropical depression which had formed far off to the east of us. It was moving slowly, and we expected to be in Oahu before its arrival. We were reacquainting ourselves with tropical weather systems after having sailed for several years in the higher latitudes. The morning of July 20, less than 2 days from Honolulu, the northeast trade winds of 17 to 20 knots blew us along at 9 to 10 knots boat speed. By the same time the next morning, we would be at the southern corner of the Big Island of Hawaii, which is called South Point, the southernmost point of the United States. I hoped to see the red of the volcanoes as we approach during the night. We needed to stay about 25 nautical miles offshore to avoid the strong winds that wrap around the coast. Our planned route would take us south of South Point, northward along the Kona Coast in light winds and flat water. We would begin crossing the Alenuehaha Channel as far north as we could, to get a good angle on the increased winds and seas in the channel. We would pass south of Maui and Molokai, and north of Lanai. The channels between these islands can be rough due to funneling winds. Lastly we would cross Kaiwi Channel to Oahu. 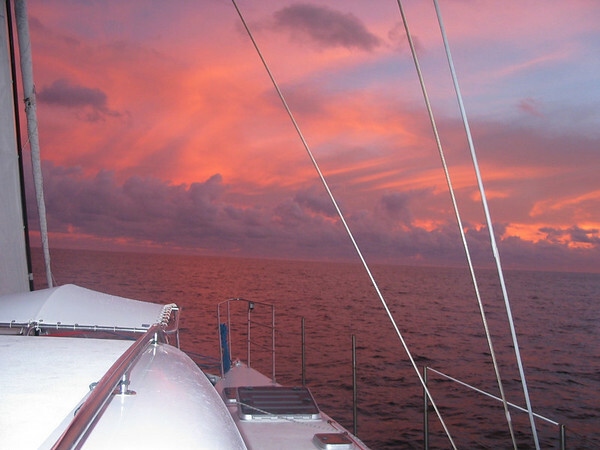 Sailing downwind along the chain of Hawaiian Islands promised to give us spectacular views during the daylight hours. We were not allowed to anchor at any of these islands until after we had checked in at Honolulu with Customs and Immigration, so we would just enjoy watching the scenery go by. As soon as we had rounded South Point, we would be in the lee of the Bit Island, sheltered from the northeast trade winds, and could motor all the way up the Kona Coast. Crossing the Alenuehaha Channel is best done very early in the morning or even better overnight, when the winds and seas in the channels are at their lowest strength and height. The channels between the islands are wide, so the navigation would be straight forward. Our menu planning was dictated by an effort to consume all the best frozen meats and fresh produce that we did not wish to have confiscated by the US Department of Agriculture. They could have the beef if they wished. The frozen chicken that we purchased in Bora Bora had been imported into French Polynesia from North Carolina, USA, so I expected that I would be allowed to keep it. At 0730 hours on Wednesday, July 21, we had rounded South Point and were motoring up the west coast of the big island of Hawaii, in 2 knots of breeze, steering to compensate for the 2 knots of current which was pushing us towards the shore, and keeping a sharp lookout for “FAD”s, Fish Aggregating Devices. During the night Callum noted, as we passed it by, a FAD that was not on our chart. The chart shows numerous FADs inshore of our course, mostly within the three nautical mile limit. We stayed three nautical miles offshore. I spotted what might have been a FAD off to starboard, also not on our chart. We were unable to see the Big Island to starboard because it was shrouded in mist, and the sun had risen behind it, shining in our eyes as we look towards the island. I was surprised to see the sun low in the sky as it rose, as I had expected it to be blocked by the volcanoes Mauna Loa and Mauna Kea. Eight nautical miles to starboard, we passed by the famous Kealakekua Bay, where there is a monument marking where Captain James Cook was killed by the natives in 1779. Another attraction of this bay is the Marine Conservation District and Underwater Park in Ka’awaloa Cove, where visitors can swim over the healthiest coral in the Hawaiian islands, and abundant tropical fish. Dolphins, manta rays and humpback whales frequent the bay. After motoring half way up the west coast of the Big Island, we succombed to impatience and curiosity, and headed out across the Alenuihana Channel towards the island of Maui. Pronounce it however you wish, we called it the “Hallelujah” Channel. The cruising guide warns that the channel crossings can be very rough, and are best made during the night or early morning, at the north end of the channel. What the heck, we had been crossing oceans, and this was just a channel. Our risk was, however, calculated, as the trade winds were not “reinforced”. We crossed in 5 hours, from noon until 5 PM. The seas were rough, but we averaged 9 to 10 kts boat speed. We entered the Alalakeiki Channel between the island of Kahoolawe to port and Maui to starboard. The wind funneled between the two volcano peaks of Maui, whipping up the seas, but as soon as we were in the Auau Channel between Lanai and Maui, the seas settled down and we spent an hour soaking up the beauty of an extraordinary sunset and crescent moon, and preparing dinner before reaching “The Slot”. After dark, the house and street lights on Maui looked just like lava flowing down from the crater, fanning out over the valley, and into Maalaea Bay. At 8 PM the wind increased and the seas roughened as we came out of the lee of Maui and were exposed to the winds funneling through the Pailolo Channel. Our Coast Pilot writes: “It is reported that the junction of Pailolo, Auau, and Kalohi Channels, locally known as The Slot, is subject to high winds and dangerous currents.” I shut down the engines, and we sailed under full main in 15 to 26 kts of wind, boat speed 9 kts. A ship approached from the Pailolo Channel and passed ahead of us. During Steve’s watch beginning at 9 PM, four tugs towing barges were on the radar screen at the same time. During her watch, Vanessa dodged several more tugs and their barges. These vessels travel at night to avoid the strong afternoon trade winds, just as we were doing. It made for some nail-biting moments. The tugs and tows are well lighted, but cannot maneuver, so we had to wind our way between them. Our Fujinon Techno-stabi stabilized binoculars really paid off in these situations, where identification of the running lights, distance, direction and speed of travel of such long obstacles is essential. In the early morning we crossed the Kaiwi Channel from Molokai to Oahu, motoring in calm winds and seas. Honolulu and Diamond Head were off our starboard bow at sunrise. At 8 AM on the morning of July 22, we hailed Ko Olina Marina at Barberâ€™s Point and spoke to to John. He said to hail the marina on vhf radio channel 71 for entry instructions. We were told to tie up to the fuel dock, port side to, and go up to the harbormasterâ€™s office to check in. The Ko Olina Marina is west of Pearl Harbor, about 15 miles from Honolulu. Steve met with U.S. Immigration officers, and the Department of Agriculture representative came for our French Polynesian meats after lunch (during which we managed to consume some of the steaks). We were allowed to keep our meat from New Zealand, as well as cooked meats and sandwich meats. We handed over much of our fresh produce, then moved ADAGIO to berth D-92 which was an end tie. We had all the resort privileges and there are swimming beaches within walking distance. The cook’s night out found us feasting at one of the resort restaurants. My sister Mary Jane arrived on the big bird, on which she is a flight attendant to show us the town. First stop was Waikiki Beach. I forgot to take my camera, but in the end was glad. The many-ring circus that is Waikiki is beyond description and beyond photography. You just have to see it yourself. We found a ring-side table at a small cafe/bar on the beach and gazed out over the beautiful sea and beach where every imaginable water sport, water fashion, water craft and water-loving person were cavorting, weaving in and out amongst each other as each “caught a wave”, and no one getting killed. We gasped and smiled. What a sight it was! Over the following weeks Callum labored over the forestay, Steve labored over the boom repairs, and they both labored over the electric winch repairs. Parts arrived from the US mainland and from New Zealand. We rented a small car and drove to the north side of Oahu to see the surfing beaches. Unusually, Sunset Beach was calm enough for snorkeling. we picnicked on sushi. A very large seal lumbered its blubbery mass up into the sunshine on one of the beaches in front of our amazed eyes and posed for our photos. What a beautiful island. We spent many happy hours snorkeling in the man-made, fish-filled lagoons along the shore between the marina and the Ko Olina Resort. Every week or so Mary Jane dropped in for visits and more touring. Vanessa departed for her homeland and left a big, gaping hole in our party. We hope she enjoyed her passages from New Zealand as much as we enjoyed her company and sailing skills, good humor, friendship and common sense. Callum got into the swing of things in tropical America, and kept us informed about his world-wide search for a fast, adrenaline sail boat. Bill Twidale arrived from Hilo, bearing parts and mail packages, and joined in, readying ADAGIO for her final leg to Sitka, Alaska. This entry was posted in 2004 Cruises and tagged New Zealand to Sitka, Pacific Circle 2004 by Steve Darden. Bookmark the permalink.